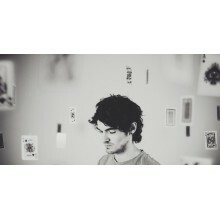 Blair Dunlop will release his new album House of Jacks on May 26th via Rooksmere Records. The British singer/songwriter has premiered a video for the single “Something Gonna Give Way,” which can be viewed below. Dunlop will head out on a lengthy tour across the UK in support of the album beginning in May, the full list of dates is below. Award-winning British songwriter Blair Dunlop returns this May 26th, with his brand new album ‘House of Jacks’. The follow up to 2012’s debut ‘Blight & Blossom’, one of the year’s most revered folk albums, House of Jacks more than lives up to that early promise. A collection of beautifully crafted songs that are influenced, but not confined, by his folk roots, Blair’s trademark guitar styling is enriched with a broader palette of instruments to create a more contemporary sound. Here, the album’s first single ‘Something’s Gonna Give Way’ (May 5th) is revealed.